I've been wanting to read this since last fall, when it came out, but it's been hard to get at the library -- always checked out. In fact, multiple copies at multiple branches of our library system have always been out every time I've looked. Lots of people have been reading this. Somehow I felt superstitious about requesting a hold. Really I've been tiptoeing around wanting to read it because I've been having a hard time dealing with bad news. Whenever I hear about any kind of tragedy or suffering, it stays with me and won't leave me alone. So I thought reading this would really be a wringer. 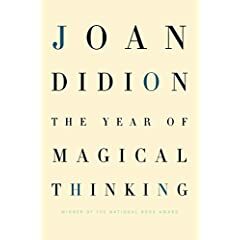 But really, it didn't have that effect on me, I think because Didion steps back a pace or two from the experience itself in order to look at it and record it. That distance is enough to give you breathing space. With an experience like that I imagine it would be impossible to write (or to move, or to breathe, even) if you didn't separate somewhat from your own grieving self. I don't want to imply that her voice was totally analytical and rational, because it was clear that she was still in the midst of it, but-- there was a bit of separation. Something that really struck me is how she returns to the motif of marking time. She relates things that happened before her husband died and in the days after to the moment itself, counting down the days, hours, weeks or months that separate the two events. Time stops with the traumatic event, and your life rearranges itself around a new zero point on the number line.